The official website for the anime adaptation of Kagami Yoshimizu's Lucky Star spinoff manga Miyakawa-ke no Kuufuku (The Miyakawa Family's Hunger) announced the staff and theme song performers on Friday. Yutaka Yamamoto or "Yamakan" (Kannagi: Crazy Shrine Maidens, episodes of The Melancholy of Haruhi Suzumiya and Lucky Star) is directing the anime at his studio Ordet and Encourage Films. Takeshi Yasuda and Hiroaki Takeuchi planned and developed the project in collaboration with Touyou Ikeda. Touko Machida (Lucky Star, The IDOLM@STER) is overseeing the series scripts, and Mamoru Ikeya designed the characters. Ken'ichi Maeyamada (songs in Baka and Test - Summon the Beasts , Nichijou - My Ordinary Life, Bodacious Space Pirates) is composing the music. While the cast has not been announced, the opening theme song "Kachigumi" is credited to the characters Konata Izumi and Kagami Hiiragi. Similarly, the ending theme song "Makegumi" is credited to Hinata and Hikage Miyakawa. 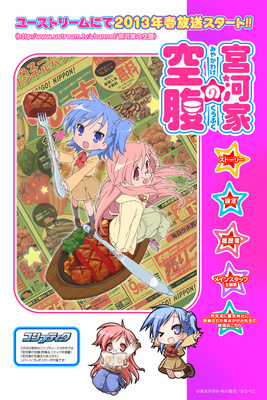 The original manga is based on the Lucky Star Moe Drill game series. It centers around big sister Hinata Miyakawa and little sister Hikage Miyakawa's impoverished daily life at home (due to Hinata's wasteful habits) and Hikage's life at elementary school. The anime will stream on the Ustream service this spring. The anime's website previews the designs and the two sisters' profiles. It also presented the wooden ema prayer plaque, hung in offering at Washinomiya Shrine, that revealed the anime on New Year's Eve last year. The ema already listed Yamamoto next to Yoshimizu's sketch. Microsoft Office 365 is slated to receive updates every 3 months, according to Kurt Delbene, the president of Microsoft’s Office division. He states that, “We already have the mechanisms in place to update the service on a quarterly basis.” The quick updates should make subscribing to Office 365 more appealing to consumers. Delbene was a bit more evasive about whether or not Office 2013 would be updated quarterly as well, but he did say that it’s possible. An analyst from Gartner, Michael Silver, speculated what the updates could turn out to be like. The updates could skip the major-minor pattern and just update applications within Microsoft Office one at a time. One quarter, Microsoft Word could be updated, and the next could be Excel. The cycle would continue throughout Microsoft’s entire list of Office products.